The Trane XC80 gas furnace includes model numbers that begin with TUD2 and TDD2. 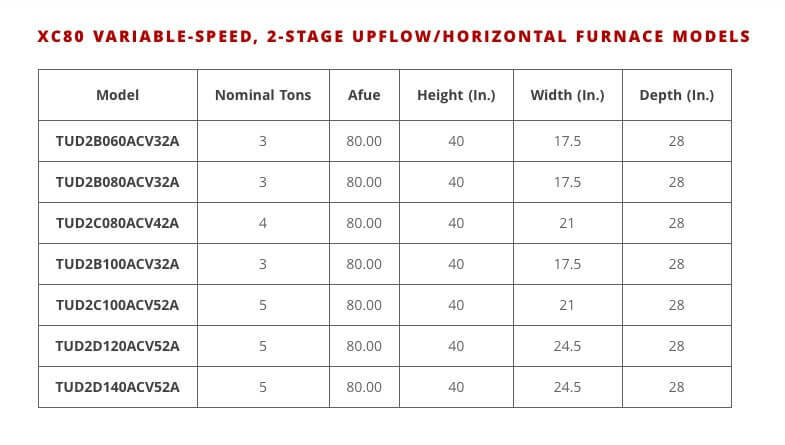 The remaining numbers refer to other specifications of the furnace. 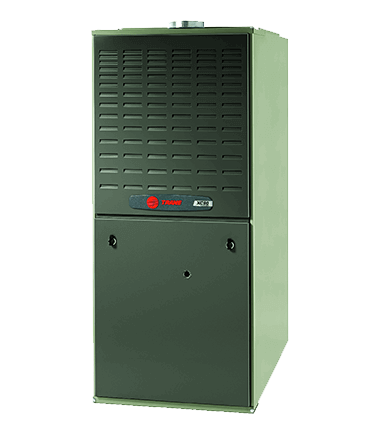 For example, the TUD2C100ACV52A is a 5-ton, 21″ wide cabinet, 100,000 BTU, furnace with a variable speed motor. Your local air conditioning company will determine which XC80 is an AHRI certified match* for your system. A complete system will consist of a new AC unit (condenser), furnace, and evaporative coil. Both natural gas furnaces and propane gas furnaces are rated using AFUE. AFUE stands for Annual Fuel Utilization Efficiency. In other words, how efficiently the furnace uses the fuel it consumes. The higher the AFUE rating number, the less it costs to operate. In areas like Phoenix, AZ where Magic Touch Mechanical installs gas furnaces, we mainly use 80% AFUE models. Areas with harsher winters that require more heating hours typically use 90% AFUE furnaces aka condensing furnaces. In layman terms, an 80% furnace will efficiently use eighty percent of the gas it utilizes. I.E. it’s ten percent less efficient than a 90% furnace. While we install 90% furnaces in Central Arizona, it’s a rare request, because of our low heating hours or “demand”. Many premium heating and air conditioning systems are fully-communicating. This basically means all of the components of the system talk to each other to provide optimal perfromance and efficiency. Communicating systems constantly monitor conditions and automatically adjust refrigerant flow (in cooling mode), fan speeds, and more. You may not think your furnace plays a role during the cooling season, but it does. The variable speed fan in the Trane XC80 is the air movement system for your AC unit as well. The xariable-speed fan motor found in the Trane XC80 gas furnace automatically adjusts its speed. These adjustments help to keep you and your home more comfortable. Of course, comfort is the most important job your gas furnace, but that means more than just temperature. Low noise levels play a key role in your comfort too. The variable speed motor in your Trane XC80 is whisper quiet so you wont have to turn up your TV every time the heat turns on! Trane XC80 Gas Furnace – Trane Quality Inside! Gas furnaces typically outlast outdoor air conditioners. This is especially true in the Greater Phoenix, AZ area. Furnaces don’t have to work as hard as our air conditioners do in Arizona. The Trane XC80 outlasts many of its competitors because of the quality craftsmanship Trane is known for. Insulated furnace cabinet – keeps things quiet!